Before you jump on an apparent punctuation error in the name, we are explicitly explained in the press release that the apostrophe omission is deliberate but that’s where the potential flaws end as Scowlin Owl unveil their excellent debut release to an audience waiting in high expectation. 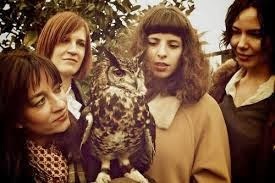 This four-piece all-female combo from London have been steadily building up momentum since their 2011 formation via hosting occasional live music nights, regular gigging and using social media to connect with a wider fan base. 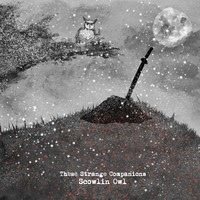 THESE STRANGE COMPANIONS is their first foray into the world of recorded music and this six track EP will immediately connect with those people who like to submerge their listening experience into a well of enchanting and mystical sophistication. The labels of folk, alt-country and Americana can be used to define the sound of Scowlin Owl but ultimately it’s their ability to give your mind a licence to wander which will entice you into a world of left field and non-conformist articulate music making. The musings of writing band members Nina Lovelace and Yvonne Bordon steer the record towards the inner thoughts of your mind and rekindles the passion of comment and recollection through song in a 21st Century context. All six songs are strong on lyrical content and several addictive hooks ensure there is a counter balance between prose and sound. Cut price quality is nowhere to be found on this record and repeat listens of the first two tracks are required to get into the zone where band founder Nina wants to take you. ‘Message From The Psalms’ and ‘These Strange Companions’ are intelligent tracks that stretch the imagination of the listener and invite you into the observational world of Nina whose link up with Yvonne laid the foundation of bringing the project to fruition. A hybrid sound emerges as we saunter through this half hour journey of mystique and intrigue. This flourishes with the appearance of the flute, another part of Nina’s creative arsenal, giving a traditional folk feel to ‘Grey’, an interesting story written by Yvonne on the well-documented squirrel species battle on these isles. The general tones from this number probably will have most listener-friendly appeal but, like so many records of this musical style, the entity exceeds the merit of a standout individual track. The subject content of a South Dakota Poker house and an extended lead electric guitar solo paint an Americana picture to the Nina penned ‘Poker Alice’ while the violin of Sally Gainsbury is set free to roam and sparkle on the final track ‘Sugawara and the Sunflower’. This latter track, a Nina/Yvonne co-write, is a true account of a Japanese Tsunami survivor and the subject has given his approval to the song. The other track ‘Mifune’ also has a Japanese theme to it and once again a fulfilling dose of Sally’s violin contribution, which is a recurring trait of the record. The role of bassist often gets referred to last so full apologies to Karina Zakri but the importance of its input into supporting the sound of the lead instruments should never be undervalued. One of the aims of Nina was to create a musical collective based on harmony vocals and all four band members have delivered on this ideal to a high standard. This type of musical arrangement is becoming increasingly in vogue with fellow UK groups Troubadour Rose and The Self Help Group being of a similar style to the sound created by Scowlin Owl. The market for such groups has the potential to grow especially from its present niche status as the quality is there for all to enjoy. The challenge is to educate the listener and THESE STRANGE COMPANIONS is the perfect record to set about this task.